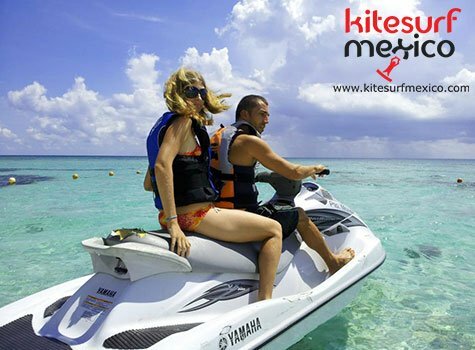 We offer you a list of activities to enjoy the nature of the Mexican Caribbean and all of the Riviera Maya. In the same park Punta Venado, where our school is located, you can snorkel, ATV, jet ski, horseback riding and other activities. We also offer other options such as diving, deep sea fishing or harpoon fishing. The Mexican Caribbean offers an underwater paradise. We can help you visit this underwater world. You can start from just diving, or even take a PADI open water course. 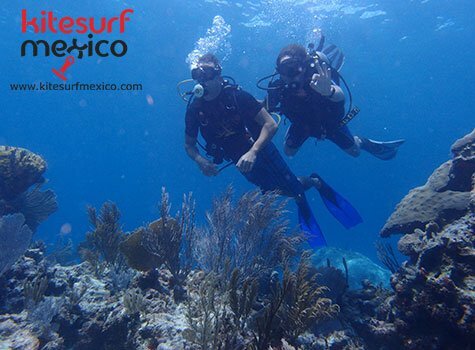 Contact us to plan your diving experience in Playa del Carmen, Cancun, Tulum and the Riviera Maya. The Whale Shark conveys peace and tranquility; swimming alongside this gentle giant of the sea in Mexico is an experience to remember and share time and again. 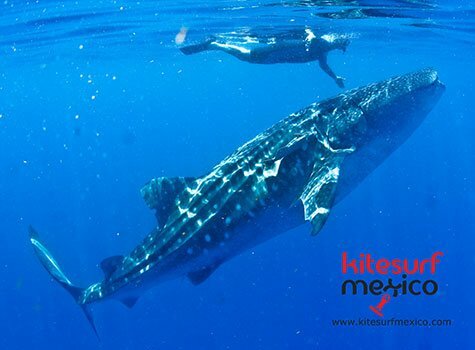 The Whale Shark migrates each year between June and September, so if you are planning a trip to Cancun, Playa Del Carmen, The Mayan Riviera or Tulum during these months, don’t miss the incredible opportunity to swim with the Whale Sharks in Isla Mujeres (in front of Cancun) and take home an experience that you will talk about and share with everyone. Whale Shark Discovery guarantees that you swim with the Whale Shark. If you don’t see whale sharks on our tour we return your money 100%. The whale shark is completely harmless to humans; it is actually a very docile and curious creature. The Whale Shark swims very slowly on the surface which makes it easy and relaxing to swim with them. Swimming with the Whale Sharks is done by groups of 2 people accompanied by a certified guide at all times. The tour begins with a pick-up at your hotel. The hour of your pick-up depends on the location of your hotel. (We will confirm the exact time of pick-up when you have completed your reservation). 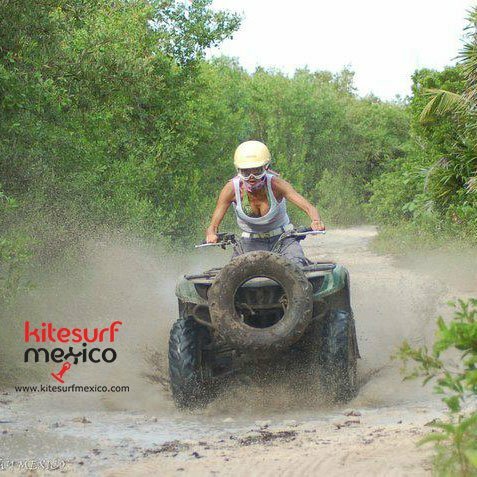 Drive your own 4-Wheel ATV along virgin white sand beaches and through the Mayan Jungle south of Playa del Carmen, on your way to a hidden cave. Here we’ll pull out our helmets and lanterns and explore the inside, revealing ancient rock formations. Back on our ATVs, we’ll head for a Mayan cenote (an opening to an underground river) where we’ll cool off with a swim, or you can just relax and take photos. After we return to the Beach Club, you can spend the whole day there, eating, drinking, swimming, or just relaxing on the beautiful beach. You can do other tours too! Ride ATVs, snorkel, or swim in cenotes at this same location! Where: The beach is located about 10 minutes south of Playa del Carmen. Pick-up and drop-off at your hotel is available for an extra cost, with a 2 person minimum charge, or you can take a taxi from your hotel. Start off this fun day in the water by snorkeling on one of the best coral reefs in the entire Riviera Maya. You’ll see a wide variety of tropical fish, sponges, and other sea life – perhaps eels, rays, or even sea turtles-. 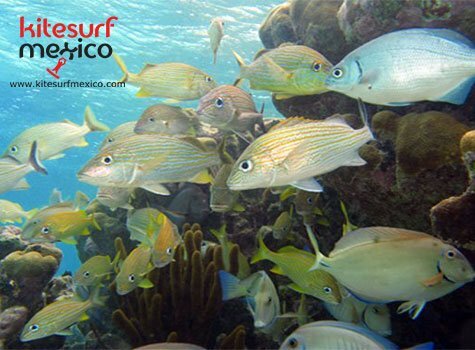 The snorkeling is done in shallow waters, so the sunlight will get through, giving you brilliant colors. After the snorkeling, we’ll go into the jungle where we’ll see a Mayan cenote – a sinkhole over an underground river where you can swim in its crystal-clear fresh waters, or take pictures. Then we go back to the beach club, where you can use the facilities all day long and eating, drinking, swimming and relaxing. Snorkel on one of the best regions for spotting coral reefs! staggering beauty of the Caribbean Sea as far as the eye can see. After riding your well-fed, well-cared-for horse along this awesome scene, you’ll have full access to our private beach club, where you can eat, drink, relax, and swim for the whole day. You can also choose to do another activity at this same site during your day. Back on our jet skis, we’ll ride to a spectacular stretch of virgin white sand beach. You’ll be amazed at it’s beauty. Here we’ll relax and enjoy a delicious ceviche. After the tour, you can relax and enjoy yourself at our beach club the rest of the day, utilizing all its facilities, including restaurant, bar, lounge chairs, and umbrellas. 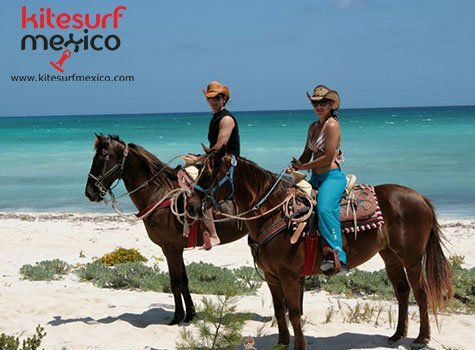 Your full day multi-adventure tour begins with horseback riding down sandy trails, gazing at the clear blue waters of the Caribbean Sea. Then get down and dirty with an ATV tour, through jungle paths to a hidden cenote where we’ll cool off with a swim in its calm, clear waters. Jump off your ATV and onto a powerful Wave Runner, where we’ll zip off to one of the most beautiful coral reefs in Playa del Carmen and snorkel with brightly colored tropical fish and other marine life. After all of these adventures, we’ll top off the day by relaxing on a white sand beach, sipping drinks from the all-you-can-drink open bar, and enjoying a nice and delicious lunch at a beach club. What an amazing and full featured tour!